This site provides information about the development, psychometric properties and appropriate uses of the Assessment Checklist measures. 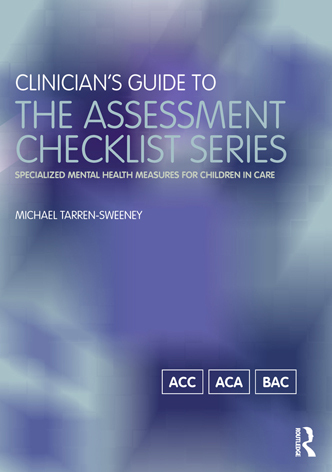 The Assessment Checklist for Children (ACC, 120 items) and the Assessment Checklist for Adolescents (ACA, 105 items) are mental health assessment measures for children and young people in alternate care (i.e. 'looked after children', 'out-of-home care') and for those subsequently adopted from care. Since the ACC was first distributed in 2007, it has been employed in over 20 studies in Europe, North America and Australasia, and is increasingly used as a clinical assessment tool by specialised mental health services for children and young people in care – particularly in Britain and Australia. Use of the ACC and ACA is restricted to approved researchers and appropriately qualified child and adolescent mental health professionals and supervised trainees. The Brief Assessment Checklists for children (BAC-C) and adolescents (BAC-A) are 20-item mental health screening and case monitoring measures derived from the ACC and ACA respectively. These measures can be safely used by children's agencies and health services without oversight by a child and adolescent mental health clinician. The BAC-C and BAC-A checklists and score sheets can be downloaded from this site.